The sailing voyage has begun with a passage from the north to Dalmatia. 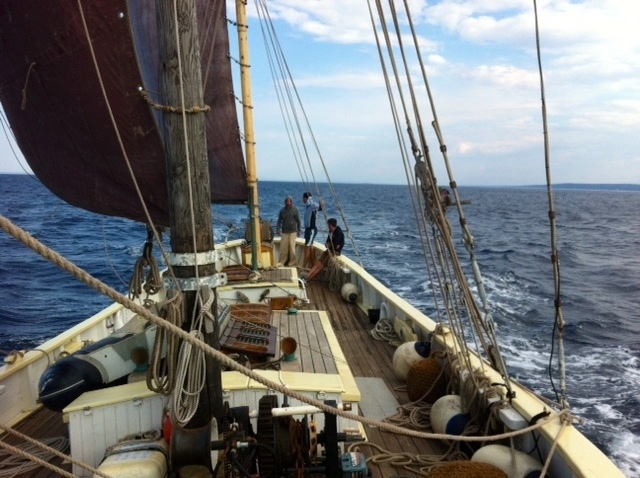 We will use this time for a training passage with the regular crew before meeting the students in Kastela. Getting the crew familiar with the boat and by ourselves was just what we needed. Leaving port with with a light NE wind, we have already covered 200 miles in three days. But in Croatia, especially in the north, the NE wind, the Bura, is never light. It is one of many named winds of the Croatian coast, and among the strongest, reaching velocities up to 70 or 80 miles per hour and more. Our summer Bura was only 15 to 20, and we felt lucky. The heavy and stable Bente Dorte loves that kind of wind, and we sailed happily to the island of Sveti Grgur (St. Gregory), the boat cruising often at six knots. The crew assembled at Novi Vinodolski the day before we left. Darin, John, Orsat, and Pavao joined me and Lovro, and together we will be teaching the students from the home the skills they need to run the boat. Each crew member has unique talents, and are natural teachers as well. But the best teacher is Bente Dorte, our ship. In our initial trip south, she taught us how to handle her gaff-rigged sails, anchor and many lines, all designed so well some eight decades ago. We got in such good training because Bente had the classes planned well in advance. On our second morning we awoke at 4 am to get to our destination, Murter Island, by dusk. 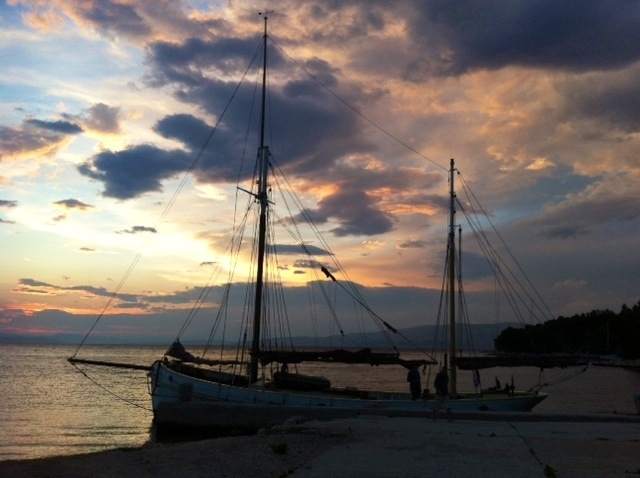 Already the Bura had increased to 25 – 35mph while we slept in our sheltered harbor at Grgur. Still a good wind for a heavy boat like Bente. Off we went and as the sun came up in the blustery gusts we set sail and steered south. Bura was good training for the crew. Set sail (of four), reef, then strike was the repeated lesson for the day. The crew learned the ways of the boat, especially that she could handle a bit of wind. Bente taught the crew that they could handle her. On the second day of the trip, we sailed 85 miles in just under 14 hours. We had the main sail up and down three times, jib up and down five times; the mizzen was up twice but stayed down for most of the passage. Only the staysail stayed up the whole time, it’s the smallest sail and can stay up in any wind. These are the learning exercises our fine Bente Dorte likes to see on her decks. Tonight we are in Dalmatia in a beautiful anchorage, Drvnik, with no wind and aqua blue water, irresistible for swimming. Now only 15 miles from the home in Kastela, we will meet the students for the first time this afternoon. Thanks to for giving us time to rest before class starts again.